Cordillera Blanca is a region of Peru's Northern Sierra. The name Cordillera Blanca in and of itself sounds imposing. Known to be one of the biggest mountain ranges in the world, the majority of its peaks measure around 6000 m.a.s.l. Located 100 km from the Pacific coast and measuring 180 km long, The Cordillera Blanca forms a natural barrier between the coast and the Amazon jungle. Every mountain top is more beautiful than the next, and many hiking trips can be arranged through the Cordillera’s grand mountain passes. The mountain roads were built centuries ago by the native people of the region. The Cordillera Blanca, and its many beautiful places, is now accessible by various roads using 4x4 vehicles. Huaraz, at 3091 m.a.s.l., used to be a beautiful little town until the terrible earthquake of 1970. Though the village has been reconstructed, it is not quite as beautiful as it used to be. That said, the National Park of Huascaran is close to Huaraz; founded in 1975 the Park is a nature preserve for the amazing flora and fauna of the region. The surrounding landscapes are beyond beautiful, and the area is also well-known for its giant plants called Puyas de Raymondy, some of which measure more than 10 meters. Definitely worth seeing! Parque Nacional Huascarán - As of June 2018 there is a 30 sole entry fee for one day, 60 soles for 3 days or you can buy a 30-day pass for 150 soles. It is not possible to buy multiple day passes, so if you are doing the 4-day Santa Cruz trek for example, you will need to buy the 30-day pass. You can sign in and buy the passes at most entrances into the park. Mountaineering guides There are official Mountaineering guides based in Huaraz. Unofficial guides don't get any compensation or even any effort to rescue them if things go awry on the mountains. Buses & colectivos run up and down the main valley of Huaraz to Caraz (S/. 6 Huaraz-Caraz), while combis run up to settlements up side valleys, such as Cashapampa (S/. 10 from Caraz) or Llupa. Porters and Burros (Donkeys) can be hired to carry loads in trekking routes and to the base camps of mountains. They will try drive a hard bargain and explain it will take longer than it will, and usually get a written contract to ensure payment. Chavín de Huántar -- The ruins of Chavín de Huantar are one of the earliest and best-known pre-Columbian sites - dating from 1500 to 300 B.C. They are a striking complex of terraces and squares, surrounded by structures of dressed stone with zoomorphic ornamentation. It can be reached by public transportation or a tour (around s/.20). The entrance is s/.11 and there is a 50% discount for students. There is a small site museum. The Cordillera Blanca and its Huascarán National Park offer excellent possibilities for trekking. Get In: The trail starts at Llupa. There are frequent combis leaving from Huaraz. It's also possible to hire a taxi and start at Pitec. Description: From Llupa it's about 1 hour walk to Pitec. From there it's about 2 hours uphill to the laguna. The last part involves a bit of rock climbing. From the laguna there is a short trail leading to the smaller Laguna Churupita. Get In: The trail starts at a site called Cebollapampa. There is a combi in the morning leaving from Yungay, which is about 1hr from Huaraz. It's also possible to get a shared taxi, & there are daily "tours" for S/. 35 from Huaraz - you pay for transport & may have a guide between 20people (guide totally unnecessary except to ensure the slow people make it up & down in time. Description: It's about 2-4 hours hiking uphill from the trailhead to the laguna. The views on the way are excellent. An alternative (and much more difficult) route runs past the Pisco base camp hut - you can make a loop, climbing up one way & descending the other. Get in: You can either start from a place called Cashapampa, which is about one hour from Caraz, there are frequent colectivos going (S/. 6 from Huaraz-Caraz, then S/. 10 from Caraz to Cashapampa). Or you can start at the other side at a place called Vaqueria, which is about two hours from Yungay (S/. 5 from Huaraz to Yungay, S/. 15 from Yungay to Vaqueria - although the colectivo drivers will often try to rip off tourists by trying to charge S/. 25. Stand your ground & refuse to overpay. Vaqueria is at 3,600m, while Cashapampa is 2,900m. Santa Cruz Backpackers is a good meeting place for independent backpackers, & Alpes Huaraz offered guided treks for S/. 300 (January 2016). The tours offered generally take 4days, but it is also possible to do this trek independently and in less days. Description: The Santa Cruz trek is Peru's second most popular trek after the Inca trail. 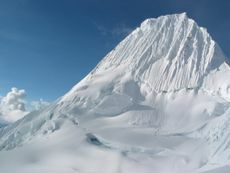 The highest point, Punta Union, is at 4,750m. Description: An itinerary which includes all of the main attractions of the Cordillera Blanca and all the typical views of the snow-capped peak of Alpamayo (5947 m.a.s.s.) – declared to be the world’s most beautiful mountain by the UN in 1968. Fried fish, from the mountain lakes. Soups are often served with a fowl's foot included. Mate de Coca, a drink made from Coca leaves infused in boiling water, Supposed to cure upset stomachs, Altitude sickness, and almost any ailment. You get whole leaves in bars or cafes, but you can buy teabags with a handy string to pick the bag out when brewed. All running water must be treated as suspect, and treated to make it drinkable. There is a risk of guiardia so chlorine treatments only will not kill these, use reverse osmosis filters or iodine drops of boil, but remember as you are at altitude, the water will boil at a lower temperature and you should let it boil for a minute or two, rather than a short boil. Orange juice, from traders on the street, who use a lathe like device to skin the orange before crushing it. This page was last edited on 10 June 2018, at 12:07.